Mounting and framing bring art to life! At Baas Framing Studio, we can assist you with paintings on canvas, fabric, board or any other surface. Paintings and prints on canvas require special treatment. We offer canvas stretching and mounting – we’ve stretched pieces up to 8-feet wide. Don't want to see rough edges or staples? No problem! Gallery wrapping, liners and various frame styles can solve these issues. Our staff is ready to help you get your canvases out of tubes and onto the wall of your home – all of them framed in style! We’re happy to advise you on how to best present any work on canvas. Contemporary abstract painting on canvas in a float frame for a modern look. We added a striped liner for additional visual interest and texture. This elegant painting needed a framing solution that didn’t box it in. Float mounting on linen with a silver gilt frame was the perfect solution. 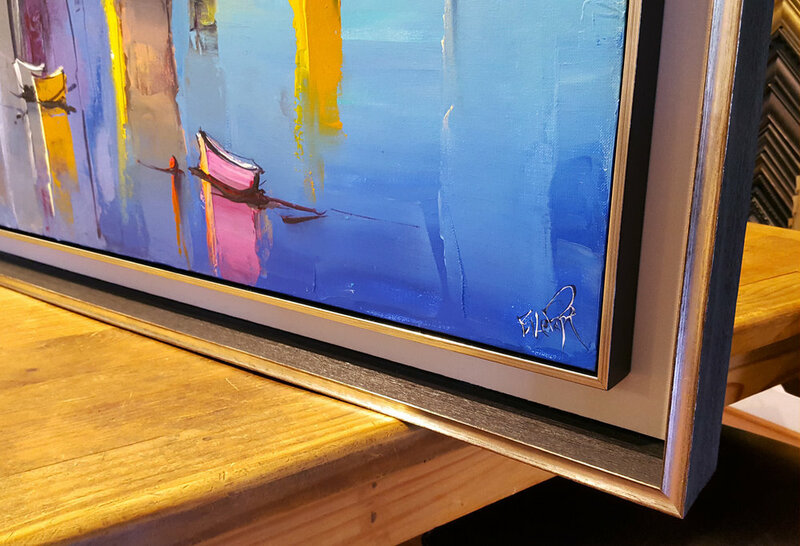 After stretching this colorful canvas, we added a thin gold "float" style frame around the edge. This was mounted to a wide linen liner and set inside a larger gold frame to create an elegant, deep setting for above a mantle. Paintings on canvas boards can be framed a number of ways, and most do not require glass. A soft white linen liner and rustic painted wood frame complement this vintage painting. This 20th century oil painting gets a beautiful setting in a soft, antiqued silver frame with delicate design. The tones of silver are harmonious against the neutral colors of the painting. 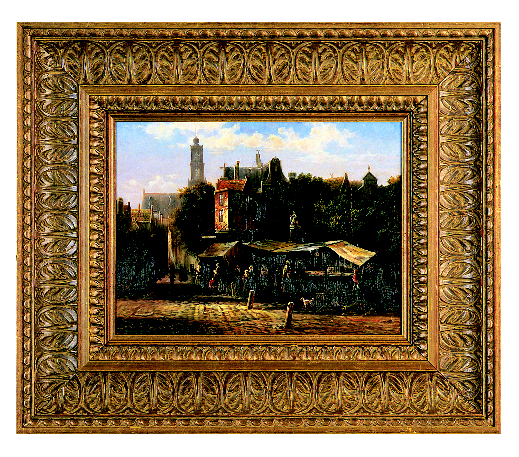 A historical landscape painting gets a traditional treatment in this wide burnished gold frame with carved leaf pattern. The warm tones and detailed carving draw you towards the painting for a closer look. “Raku” acid-etched frame on sepia-toned contemporary painting of bathers — an incredible match! An expressive acrylic painting needed a simple, strong setting to give it polish. This clean frame in metallic tones with a dark lip was the solution. So it's not a real Vermeer... who cares? With this frame, you could have fooled us. Wide dark framing is very Dutch and the silver gilded lip adds a luxe touch. The dark setting makes a dramatic window into the world of the artist and his model.